There’s nothing quite like a steaming hot serving of noodles. Swimming in a savory broth or coated in a delicious sauce, they not only satisfy, they also serve as comfort food that warms the belly along with the soul. The following noodle places are the best in Massachusetts! Serving up a nice selection of both noodle soups and ramen dishes, Noodle Street features excellent food in a casual atmosphere. The spicy miso ramen is a fan favorite. Dine in or take your noodles to go. Choose from a variety of dishes at Shabu & Mein, including ramen, gluten-free noodles, and mushroom-based soup noodles. Enjoy them on their own or with one of countless add-ons including shrimp, pork or stir-fried butter corn. Since Boston and the Japanese city of Sapporo have very similar climates, the owners of Ganko Ittetsu Ramen believed their Sapporo ramen would be a big seller in Massachusetts. Cold, snowy winters and warm summers are perfect for this kind of noodle dish. Unlike ramen that’s simply added to broth, Sapporo ramen is cooked in a wok, which results in a more delicious flavor. Choose from several types of ramen at Hakata Ramen. Hakata Chashu Ramen is made with a pork bone broth and served with chasu. Hakata Gekikara Ramen is made with miso. Eat in or take your order to go. Noodles serves up hot, delicious dishes made from your favorite staple—noodles. 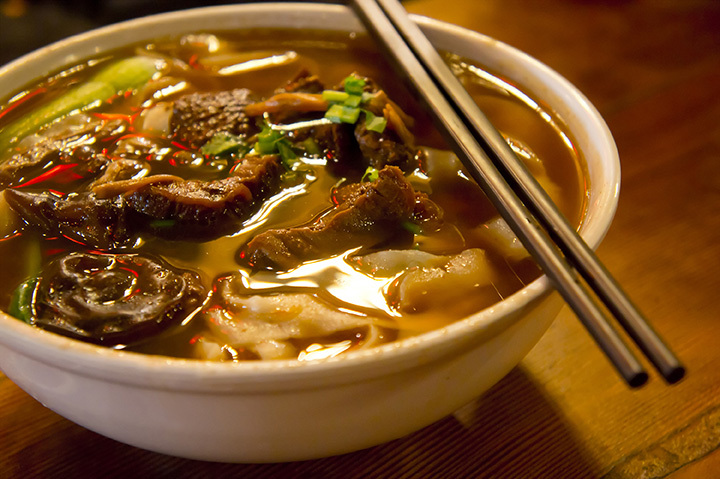 Try Kim Chi dumpling noodle soup or pink lady noodle soup. Choose from rice noodles, Thai noodles, egg noodles or clear noodles. Indulge in roast duck ramen or home-style won ton ramen soup when you visit Iya Sushi and Noodle Kitchen. Or try something really extravagant and treat yourself to Korean bulgogi, made with sweet potato noodles instead. Oisa Ramen’s hashtag is #ownyourslurp, and that’s exactly what you’ll do when you dine there. Choose from vegetarian ramen dishes to Wagyu Don—beef with pickled ginger. The flavors will explode and the noodles are second to none. Choose from four types of special ramen at Totto Ramen—Curry Paitan, Taiwan Paitan, Mega Paitan, and Spicy Nibo Paitan—and then select from a vast array of toppings. For a small fee, all their ramen can be made extra spicy, which is how many of their regulars prefer it. Somerville is their only location that takes credit cards, so be sure to bring cash if you’re visiting their Allston or Boston location. Featuring Thai and Vietnamese noodle dishes, Noodle Barn offers up delicacies including Hu Tieu Xao, Pad Thai, Bun Curi, and more. Enjoy both bold and delicate flavors in the options on their extensive menu. “Fearless and Bold” is the tagline at 1981 Ramen Bar, and according to their customers, it fits. They take a fearless approach to creating unique, flavorful ramen while still honoring its origins. Choose from smoked chicken ramen, tonkotsu ramen, vegetarian ramen, and more.